Johnny Slivers had the most liked content! Let me be clear. I have qualms about this third installment of Ravnica, but I’ll save that rant for another day. Instead I want to talk about the REAL potential of a third installment of Ravnica which is the Ravnica Themed Cube (RTC). Of all the worlds in Magic the Gathering, Ravnica is by far one of the more popular and tidy ones to design around. The ten guilds very easily split into two large sets. Each guild has gotten its own unique mechanics in the past and it sounds like they will get a third unique mechanic for this run as well. The synergies/stories all blended nicely and the template is seemingly more intuitive to build around. Now here are some potential bonuses for the Ravnica Themed Cube at large with this third installment. 10 new mechanics This latest instalment of Ravnica means RTC’s will have a total of 30 unique mechanics to work with for their construction. This creates a huge array of combinations for RTC’s to toy with and even means it could focus on fewer guilds at one time. Imagine a small RTC focusing exclusively on the inherent conflict between the Azorious and Gruul guilds, or imagine a 720 card RTC of all the best cards across the history of Ravnica. I think there is a lot of potential here. Rock, Paper, Scissors Lets face it, not all Ravnica guilds are created equal. With 30 mechanics to draw on there is also a better chance to balance out the interactions between the guilds. This way a player is less likely to get “stuck” on a sub-par mechanic and have a negative play experience. This also helps to balances the predator/prey relationships between the guilds. Potential for a new dual lands As wonderful as it would be to see the shock lands return, for RTC’s it’s important that we have a diversity of dual lands especially for the ambitious 720 count versions. Now in the first Ravnica block we got Bounce Lands. In the second we saw Guild Gates. It would not surprise me if we saw a third new Ravnica themed dual land at common. This will help greatly with the larger RTC’s. Greater access to the Plane Popular as Ravnica may be as a plane, the arrival of the first Ravnica block had the great misfortune of showing up during one of the largest declines in the Magic the Gathering player base. This was due to the overpowered nature of the Mirrodin block which nearly sank the game. As a result there were far fewer boosters printed for the first Ravnica block making the cards much harder to acquire today. Conversely, the Return to Ravnica block had a massive print run with booster boxes still selling for close to MSRP at the time of this article. This third installment of Ravnica means newer players will have an easier time of diversifying their own RTC. This will be further aided by the introduction of the Guild Kits which are supposed to include cards from all the Ravnica blocks but we don’t know much beyond that. These kits may even be an unofficially-official nod by WotC to the support of RTC’s….or I could be making that last notion up. In the end it means you won’t necessarily need to have been playing religiously since 1994 to have a shot at making your own RTC interesting and fun. Of course, I’m not an aficionado of the cube at this point. I’ve cannibalized my own cube to sleeve up EDH brews. For more sound advice on this idea of a Ravnica Themed Cube and other cube topics I highly recommend reaching out on Twitter to @CubeApril, @MiloDaGreat1 and @LifeBeginsAt20. They actually know what they’re talking about Cheers! J. Today I bring you a review of a fellow human being. You see that guy up there at the top of your screen. Yeah, dat guy. That is my good online buddy Jon Dunning. He's a movie buff and Red-Letter Media addict. More importantly, he’s a player of Magic the Gathering and he’s doing something pretty cool. A little while back he started running an interview series called The Hive Mind. This series was originally a prerecorded format where he would conduct interviews with members of the Magic the Gathering community to learn about who they were and what made them tick. Some of his early guests included people like Randy Buehler, Sam of Rhystic Studies, Kevin from Rogue Deck Builder and many more. Eventually he took a temporary break from the series. A new job and relocation to the Seattle area (no, he’s not at wotc) did play a role in the break. During that time, he did some assessing of what he was looking for and how to balance his content creation with his gamming life. Eventually he paired his magic card collection way down and converted some of that cardboard into sweet technical upgrades for the content creation he was getting into. This brings us to what I like to think of as The Hive Mind 2.0. The first slam dunk was the upgrade in his sound thanks to a new Yeti USB microphone by Blue. The next improvement was going to a live format using the streaming feature on Youtube. This was a great move allowing viewers an opportunity to have real time interactions with Jon and his guests. I personally have had the good fortune of getting some of my questions answered at the end of the interviews and his guests gave some very insightful responses. Who are some of these guests of late? Oh, you know. Nothing huge. Pro-player Brian Braun-Duin showed up for a chat. Ted and Efren from Cardsphere were recently on. Oh yeah, and some teacher dude showed up from some community college….Yeah. You heard me. 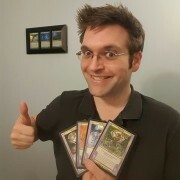 The Professor of Tolarian Community College showed up for an interview with Jon Dunning. We even got a little sneak peek at how prof really feels about Channel Fireball. I dare say we can expect to see even more #walue in the near future ?. The end game is simple. If you haven’t been watching The Hive Mind by Jon Dunning, get there. If you’re not already following Jon Dunning on twitter @OrzhovDunn, get there. Let me tell you something. This fine fellow human being of ours is a micro brewer of online content that you will want to see the evolution of and he is absolutely going to get there. J.
Hello Friend, Is every member of your EDH night going "something something Muldrotha something something Hurp-Durp?" Do you think Muldrotha, the Gravetide is a cool commander but know for a fact everyone else is going to be playing the same Glacial Chasm lock? Does your entire LGS reek of graveyard shenanigans? Have no fear. Today I bring you a veritable cornucopia of countermeasures to lambast the gallivanting gangs of giddy graveyard groupies running amok at your local EDH tables. Lots of it will even be budget friendly Specific to Muldrotha, the Gravetide I suspect combo will be a thing so if you're not running black, please consider the following. If you want to be "That Person." ( You know who you are. We know you have the tutors ) + Also in a Muldrotha meta you are likely going to run into Zombie Infestation, sooooo = + + + + + The odds are pretty good a Muldrotha player is trying to get extra walue out of discarding as well. Be sure to pack these little nuggets: And finally, since we are hating on graveyard shenanigans, I give you the following Bon appetit! J. Admittedly I am not that well versed in all of the eternal formats. I use the expression of Eternal formats pretty broadly. I can see it being a harder sell for something like modern where I imagine Karn is more likely to see play on turn 3 instead of turn 2. I understand this isn't necessarily what players want to be committing to an entire third turn in a format where people are either winning or locking it in on turn 4. Even then I would say any deck that can reliably drop Karn, Scion of Urza on turn 2 or sooner in whatever format is creating a major uphill battle for their opponents. Is this true? Not exactly. Though IF Shahrazad and Sphinx’s Revelation were put into a blender, poured out into a Magic that Gathering cookie cutter and sundried for abouuuuuuuuuut 3 days….you get Karn, Scion of Urza. “What the hell are you talking about Johnny? Stop putting tequila in your coffee!” No. I can’t. It's awful tequila and this is making less and less sense so here’s some nice pictures of magic cards. Now that we have those cards in front of us I will explain why I think Karn, Scion of Urza really is the fixed Shahrazad that Magic always wanted. What we see with this latest manifestation of Karn is one of the greatest sub-game mechanics to hit the game. When it came to the sub-game concept with Shahrazad the biggest problem I’ve heard about was the copious amounts of time it would take to pause a game, play a second game, then go back to playing the first game. Imagine the mirror match where Shahrazad is played 8 times in a single round. Leonardo DiCaprio would literally show up and beat both players senselessly with a bag of tortilla chips until they woke up form the 8-layer nightmare dip they were drowning in. New Karn fixes this by creating a sub-game within a game. Think of it this way. When you play Karn, Scion of Urza your opponent is now forced to play against 3 hands at once. The first is the hand that is drawn organically which they generally have little to no information on. The second is the hand they choose for you. This is the hand they think they can handle and play around. The hand they believe will gain you the least amount of board state. The third is the hand they put on layaway. This is the hand they don’t want you to have right away and/or don’t think they can deal with. Best of all, thanks to the silver tokens put on this exiled hand, this hand is always a looming threat because Karn, Scion of Urza will likely be a 4 of in any of the decks it finds a home in. It is a massive head game for your opponent and a wealth of knowledge about the resources they have to work with. The “sub-games” are basically stacked on top of each other. Also, much like it was the case with Sphinx’s Revelation, the amount of card draw that is taking place with Karn means the opponent is likely losing the game long before they even realize it. Unless of course they too are playing Karn and the whole game state becomes a battle of wits. Now the best part of all this is the fact that Karn is 4 generic mana to cast. He can literally be plugged into every deck that wants to make him work. This is huge. We’re talking about a Planeswalker that could easily see play on turn 2 and even turn 1 in the eternal formats. Never mind how busted this will be if Planeswalkers are allowed to be commanders in EDH proper (I predict he would be turbo banned as a commander.) He is in my opinion the new best planeswalker available to the game of Magic the Gathering. I suspect he will make substantial waves wherever he goes. That’s my 2 cents on the matter. Hope this entry is finding you well. Until next time, have yourself a great day. J. Today I share with you my thoughts on Ghitu Lavarunner, why I think it is a fantastic way to shave $100 dollars off any Burn deck calling for Goblin Guide and why it totally brings Pauper burn up a notch. Please note: Goblin Guide is always going to be better than Ghitu Lavarunner. Goblin Guide is a turn one 2/2 with haste that may give your opponent land, but forces them to cough up information regardless, which is always useful to a burn player. That said let’s talk about the pro’s and con’s of Ghitu Lavarunner in the Burn archetype. Plainly and simply Burn lives to get Ghitu Lavarunner switched on as early as turn 1 but reliably on turn 2 when you are likely going to cast it. The typical line of play for this card will be Turn 1: Mountain, bolt spell. Turn 2: Mountain, bolt spell, Lavarunner, move to combat. That stands to bring the opponents life total to 12 by turn 2 which can easily put burn within striking distance for lethal in some cases. While this can also be a common play with Goblin Guide as well, Ghitu Lavarunner needs you to play in this order to switch it on. This is unfortunately the Lavarunner’s biggest weakness as it forces you to use 5 resources out of your hand by the second turn to be effective. This can make your strategy much more of a glass cannon strategy leaving you less room to throttle back to stabilize the board if you need too. Even with this drawback I feel Ghitu Lavarunner still has enough power to be a viable budget component of a burn brew. Now when we switch over to Pauper things change dramatically. Ghitu Lavarunner is going to take Mono Red Pauper Burn to the next level as an aggressive body that is harder to kill in a format where a toughness of 2 matters. This is where I think we will start to see Firebrand Archer fall by the wayside. Unfortunately for the archer a toughness of 1 makes it very fragile and a cmc of 2 means it shows up late to the damage party when weighed against the lavarunner. I just feel the Ghitu Lavarunner is going to be a way more efficient tool for delivering damage in the Pauper Burn brews. All that said I think the Ghitu Lavarunner is going to do some great work in the world of Burn. I look forward to seeing how things shake out for it. J. Agreed, though this can be challenging when the crappy place is the only place. At that point you just need to start your own pick up games at a favorite coffee shop or bar. That's what I was doing with my friends before a proper LGS set up shop in my town. Challenged myself to upgrade Arcane Wizardry exclusively with Mind Seize. Hope you enjoy ***Edit: My apologies. I believe I got the Inalla/Jeleva card interaction wrong. There was an LGS I where I played in a 2HG tourny. One of the teams named themselves "Big Dicks Only" or something to that effect. I was teamed up with one of my female friends and as they boasted about their name after getting paired with us, I playfully agreed that they were in fact the biggest dicks in the room. Just an amusing heckle moment on my part. Truthfully I agree with the sentiment that you need to know your audience and gauge your language accordingly. That's not censorship, that's just being aware of your surroundings and who is around you. Also, it's not enough that you meant one thing when someone interpreted it differently. Message meaning received by someone is never something you have actual control over. This is one of those academic kinds of communication concepts that the general public is simply not going to be considering all the time. Add to that the use of open forum technologies like twitter and you have a recipe for the bickering and drama we find on social media. There's more to all this but that's my 2 cents for now. Today I bring you some Show and Tell with a piece of #mtg memorabilia. We crack a pack of Aether Revolt Lastly I talk about my survey where I ask the question: Would you be willing to play eternal formats that ban the Reserve List? Big thanks to everyone who participated in the survey and I hope you enjoy the commentary.